The Columbus Project, a large body of work by the late Aboriginal artist Carl Beam represents a repossession of indigenous identity and is considered a prominent historical milestone. 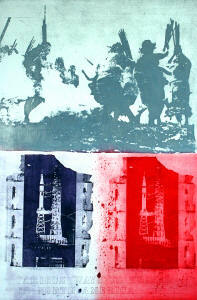 Part of that project, The Columbus Suite, is a suite of 12 powerful etchings that faces the “discovery” of the Americas. For many of those familiar with the stunning and renowned work of Carl Beam, they know the significance, and rarity, that his work brings to Canadian history. The Columbus Suite is a series of 12 prints that were completed in 1990 in response to the ‘celebration’ of the 500th anniversary of the European ‘discovery’ of the Americas. Many people, including those whose ancestors were indigenous to North America, found the celebration ironic and troubling because it represented history as seen from only a European perspective. In these images, Beam uses historic figures such as Christ, Riel, Sitting Bull, Einstein, Lincoln, Kennedy, Columbus, juxtaposed with numerous historical references and symbols, to make art work that represents a contrasting, yet balanced, assembly of heroes from different cultures. complete series of 12 prints on Arches paper. each one is 31.5" x 47"
Carl Beam's work strongly expresses Aboriginal cultural and political history in Canada and globally through the use of diverse media such as drawing, watercolour, etching, non-silver photography, photo transfer, photo emulsion, installation and ceramics. His work is found in major Canadian and international collections including the National Gallery of Canada, the Art Gallery of Ontario, the Vancouver Art Gallery, the Winnipeg Art Gallery and the Albright-Knox Gallery in Buffalo, N.Y.; and has been exhibited throughout North America as well as in Italy, Denmark, Germany and China. 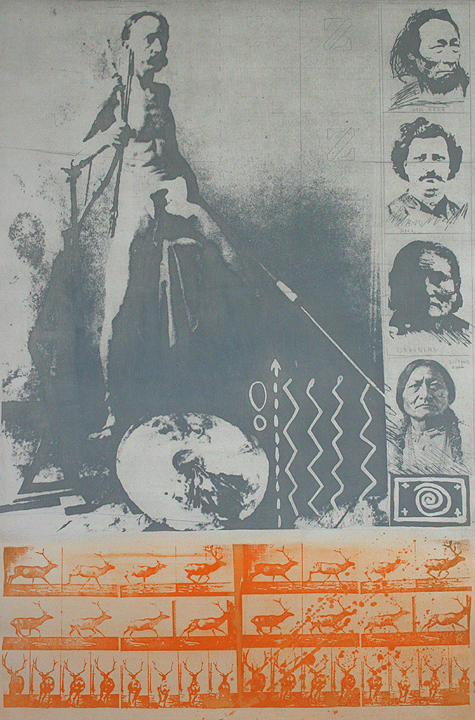 As an artist, he has been instrumental in the development of art for Canada’s First Nations. His style has exerted a strong influence on a generation of Aboriginal artists. He obtained a Bachelor of Fine Arts from the University of Victoria and did post-graduate work at the University of Alberta. Carl Beam was inducted into the Royal Canadian Academy of the Arts in 2000. He resided in M’Chigeeng, Manitoulin Island, prior to his death in July 2005.